The US Supreme Court has granted a stay of execution to a death-row inmate in Mississippi moments before he was due to die on Tuesday evening. 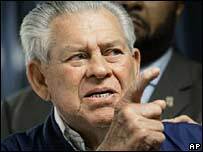 Earl Wesley Berry's lawyers requested the execution be stopped until the court rules on whether death by lethal injection is unconstitutional. Berry murdered Mary Bounds, 57, as she was leaving choir practice in 1987. His temporary reprieve adds to a series of stays granted since a challenge was mounted in Kentucky in September. State and lower federal courts have been facing claims from a growing number of death-row inmates that their executions should be put on hold until the Kentucky case is decided early next year. These courts will probably interpret the Supreme Court ruling as a signal that they should impose an unofficial moratorium on executions until then, say commentators. Berry had eaten his last meal and said goodbye to his family but was not yet in the execution chamber when the Supreme Court ruled. Justices Antonin Scalia and Samuel Alito were the only two judges reported to have opposed the reprieve. The Supreme Court ruling reverses an earlier finding by an appeals court in New Orleans, which argued Berry - who was sentenced to death in 1988 - had waited too long to challenge the constitutionality of the lethal injection method. 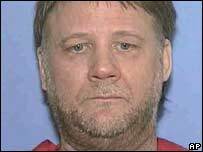 The husband of Berry's victim, Charles Bounds, responded angrily to the stay of execution. "[He] takes her out there and beats her half to death and she don't die and he beats her head up against a tree until she does," he told corrections commissioner Chris Epps, according to ABC news. "Now you want to tell me that we got a fair shake here today?" There has been only one execution - in Texas - since the Supreme Court agreed to consider the challenge to the use of the lethal injection lodged by death-row inmates Ralph Baze and Thomas Clyde Bowling Jr in Kentucky on 25 September. The pair argue that the method constitutes "cruel and unusual" punishment - forbidden by the US Constitution. Their challenge will not overturn death sentences, but it could change how America carries out its most serious punishment, says the BBC's Rajesh Mirchandani in Washington. During an execution by lethal injection, prisoners are given three drugs: firstly a sedative, then a drug to paralyse all muscles except the heart, and finally a drug to stop the heart and kill the prisoner. Campaigners argue that the use of the sedative makes it impossible to determine whether or not the prisoner is suffering pain. US lethal injection: End of the line?